The Sunday Night series has lived at Room 43 for ten years, and was founded even earlier, in 1995. Since the beginning, it has been planned, staffed, and sometimes even performed in by the Hyde Park Jazz Society, an all-volunteer organization dedicated to jazz on the South Side. On the night of January 20th, the vice president of the Jazz Society, Almarie Wagner, sat in front of the venue collecting entrance fees from a steady stream of concertgoers. Inside, the audience sat comfortably around tables lit by electric candles. The background din of soundcheck rang off the venue’s loft-like brick walls and church-like wood floor. Room 43 was especially crowded that night for two reasons. First, because it was the Sunday before Martin Luther King Jr. Day, so almost nobody had to wake up early for work. And second, because the Charles Heath Quartet was playing. Charles Heath, the group’s drummer and bandleader, is a maestro of percussion who, according to his mother, has been playing since the womb. Later in the night, she would tell a story from when she was pregnant with Charles: in church, she was sitting next to the band, and when the drummer started to play, baby Heath kicked in time. The Quartet, too, has a storied history of musicianship, and as the show began, Heath announced them accordingly. On bass, Junius Paul, who has been playing with Heath since the nineties. On piano, Richard Johnson, who the drummer calls “somebody you should know,” and on saxophone, Isaiah Collier, who met Heath at a jam session when he was fifteen, and whose band The Chosen Few has played with Chance the Rapper. All eyes were on Heath as he picked up his drumsticks, but when he started to play, it was hard to tell that he was leading the Quartet. He was hidden by his cymbals, which blocked him like the heads of two gigantic, motionless audience members. Heath was in the backstage of his own show, evidently keeping himself in store for later, which wasn’t a new strategy for the drummer. Last year, Heath led his band at the University of Chicago’s International House, for a concert held by the radio station WHPK. For most of the show, he might as well have been mixing a salad, calmly stirring his drumsticks around the snares. Then, at the very end of the night, he removed a single cymbal from his drum kit and soloed on it for five full minutes. This night at Room 43, there was every reason to expect that Heath would again postpone his solo until the last minute. Meanwhile, the rest of the Quartet took care of soloing. At first, saxophone and bass led the show. 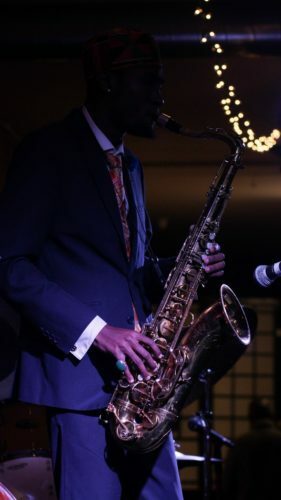 Isaiah Collier, heaving his alto, stood in front of the band wearing a blue flower on his lapel and a dashiki hat on his head, and played gracefully. When Collier finished, he would take a break and walk offstage to reveal Junius Paul, who then took his turn to solo, walking his fingers briskly up and down his bass. Up until this final song, Heath had played with versatility, but he had focused on grounding the band. It was only on “Softly” that he flew into orbit. When he began to solo, Heath didn’t even touch the snare drums. He played like the wind all over the cymbals. No salad-mixing anymore—now he was practically doing kung-fu. The cymbals that had concealed him motionlessly before were now swinging hard, nearly clashing together. For much of the show, audience members had kept time by snapping, foot-tapping, head-bobbing, or knuckle-rapping. But keeping time with the sheer speed of Heath’s solo was impossible. It was hard not to grin at the performance. By the time Heath finished playing, even the audience was exhausted. It was the end of the first set, so everybody took a little break before the second one started. Some ate birthday cake (it was Heath’s mother’s birthday), some spoke to the musicians, and some went downstairs to relax. Then, after a solid rest, the Quartet got back up on stage with a new batch of songs, ready to do it all over again. Almarie Wagner is a non-profit consultant and longtime jazz lover. She is the Vice President of the Hyde Park Jazz Society, an organization founded by her husband, Jim, in 1995. In an interview with the Weekly, Wagner discusses Room 43’s history, the evolution of the Hyde Park Jazz Society, and her life with jazz. This interview has been edited for clarity and length. Have you always been into jazz? No, I didn’t know anything about it until I met my husband. I came from a small town in Tennessee, so jazz wasn’t in my world until I met him. We were students in the School of Social Service Administration at the U of C. I didn’t know him until the summer after we graduated, but that’s when my education in jazz began. What is it about jazz that you love the most, now? Well, it gives me joy, it gives me peace sometimes, excitement a lot of the time. It’s a very special, important kind of music to me. It sort of feeds the soul. Could you describe the Hyde Park Jazz Society for me—what it is, who it is, what it does? This is an organization founded by my husband, Jim Wagner. The Committee to Restore Jazz to Hyde Park is what it was originally called. He founded it in ‘95, and it was a small committee, and he worked with that little committee for many years. My husband and his good friends had grown up on the South Side. He was a DuSable student, he’d graduated from DuSable High School, and all of his friends embraced jazz, loved jazz. And the South Side was the center of jazz in the whole Midwest all during his youth. And when it sort of collapsed—partly due to urban renewal, partly due to other kinds of music taking over—it always troubled him that jazz was no longer the go-to music that it had been in his youth, so he was determined to bring jazz back to Hyde Park and to the South Side. Willie and Jim used to laugh about that conversation, but it really did open Jim’s eyes. And so he recruited some non-musicians, including Charlie Thomas, who’s now the president, a jazz lover but not a musician. That really kinda changed things. And so it became the Hyde Park Jazz Society. We began Sunday night jazz back in 2006 (though by the time it really launched it was 2007), and have had Sunday night jazz every Sunday night except for Christmas, New Years, and the Super Bowl ever since. So how did Sunday jazz get established at Room 43? Because I understand it’s a rocky history. Very much a rocky history and a little complicated. We started at the Checkerboard Lounge, which was in Harper Court in Hyde Park. And that was very much supported by President Don Randall, at that time the President of the University of Chicago. He and Jim had developed a friendship, and Don Randall was by avocation a jazz pianist. So, he really wanted more venues, more places for students to go to, and he loved the idea of bringing jazz back to Hyde Park. So Jim met and talked with the owner of the Checkerboard, which had closed a near-South Side venue because of problems with the property. And the owner was looking for another place, and Jim worked with the University and with Don Randall and got some support for him to come to Hyde Park. That’s where we started and where we were for a number of years until actually ironically, the summer after Jim died in 2009, the relationship with the owner really soured. We very fortunately had already connected with Norman Bolden, the owner of Room 43, and he invited us to come there back in June of 2009, and we’ve been there ever since. What are some of the most memorable moments you’ve had working with the Jazz Society? Well, the most important thing about this for me is that Jim’s dream was more fully realized than he could have ever imagined and than I certainly ever imagined. His dream was to bring jazz back to the South Side, and that has been fulfilled in so many remarkable ways. Not just with the jazz we have every Sunday night, where we developed a love affair with the musicians and with our audience, which is our family. 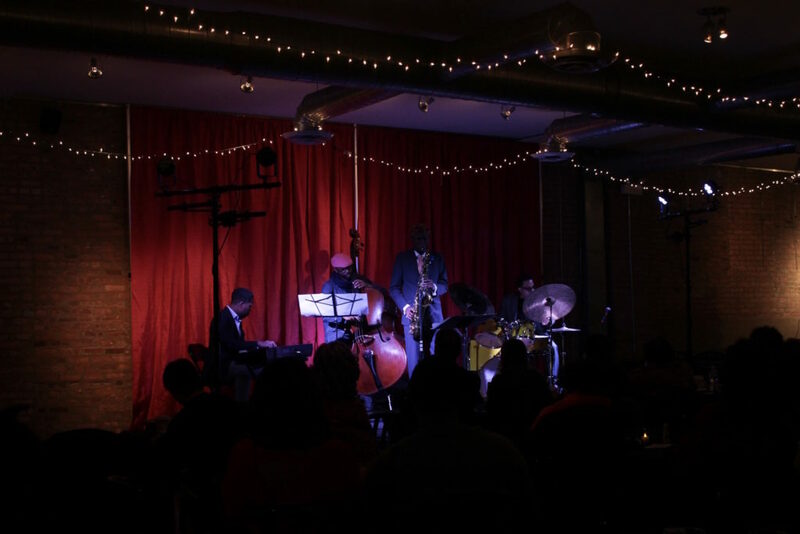 That has been an amazing, ongoing experience, but not only that—it also spawned a number of other venues for jazz in other places on the South Side. So, jazz is booming on the South Side. And you know, it ebbs and flows and it’s always a struggle raising the money to pay musicians what they ought to be paid. It’s a challenge continuing to build and hold an audience, but things have really turned around, and there’s jazz happening almost every night of the week on the South Side, as well as on the North Side. That’s more true now than it used to be. So that’s for me the deepest meaning for all this, is that Jim’s dream has been beyond imagination fulfilled. And it also spawned the Hyde Park Jazz Festival. The Hyde Park Jazz Society along with the University and the cultural institutions in Hyde Park developed the idea of the Hyde Park Jazz Festival, which was launched in 2007, and we just finished our 13th year. And then getting to know and love the musicians and the jazz family for me…I had a very small family, Jim had a very small family, so they’ve become family to me. And that’s pretty special. Where do you think the Jazz Society is going from here? Well, we are a very small band of volunteers. We don’t have staff, everything you saw last night at our performance was run by an even smaller band of volunteers than usual. But in terms of managing the lights and sounds and the candles on every table and making everybody feel at home, all of that is taken care of by a small group of board members, as well as some other people who love us and who help out whenever it’s needed. We don’t have huge visions of big things to come. A lot of the visioning has moved into the Hyde Park Jazz Festival, which has staff and funding and that kind of thing. 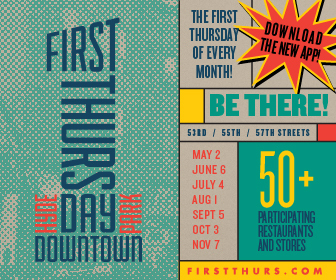 We do have the series at Logan Center, which is in its fifth year, where we provide jazz, curated by Judith Stein, eight times a year, every third Tuesday during the school year at the Logan Café. That’s been an outgrowth of the Hyde Park Jazz Society, and that’s been a wonderful additional offering. It’s for free, it brings students in, as well as some of our audience, which comes and never misses it. So that’s been a wonderful extra, but we don’t have high expectation of huge growth because we want to stay volunteer-run. We don’t apply for funds, we welcome contributions. We have a membership base of people who want to support us, so we have a modest membership where people get a card, and are proud card-carrying members of the Hyde Park Jazz Society, and that helps to support us in the spring, when we have high school bands perform before our regular performance on Sunday. They come Sunday evening around six in the evening, three or four times during the spring and occasionally during the summer. So we certainly want to support budding musicians, we want to support our wonderful talented Chicago musicians, and we want to support the jazz community as a whole. Speaking of funding, where does the University play into all of this? The University supports the Hyde Park Jazz Festival very significantly. We [the Jazz Society] are supported entirely by our memberships, our Sunday nights’ modest ten dollar fee, and by modest contributions from friends. So we do not solicit public funds, we do not solicit foundation funds. And thus far it’s worked for all these years. Well actually, I’ll take it back—we have funding from the University for the Logan Center performances. That’s the only private funding we’ve got. Is there anything else you’d like the South Side Weekly’s readers to know? For me, this is a labor of love to remember my husband, who I think did something remarkable in making this happen. And I’m delighted to be able to continue it in his memory. Kyle is a staff writer for the Weekly and student at the University of Chicago. He last wrote about Dee Alexander at Café Logan.